After all the incredible hype and excitement surrounding this years finale (rightly so, in the wake of ‘The Stolen Earth‘ probably the best episode so far of the rebooted Dr Who) has died down, I want to poke through the ashes. I thought Catherine Tate as Donna Noble, and thought she was the best assistant of the reboot so far, she brought maturity and honest emotion to the role, and seemed to be more than a match for the Doctor, who seemed to regard her as an equal. Her acting in the finale, ‘Journeys End‘ was brilliant and heartbreaking as she went from Doctor-Donna to Donna the Temp from Chiswick. I will miss her, and I think her performances have proved many people wrong. The highlight of this series was Bernard Cribbins as Wilfrid Mott. He brought some funny moments (like when trying to swap his paintball gun for the huge Dalek-Buster Rose had) but he also brought a lot of emotion and feeling to the show. I was moved by his humanity when the world was slipping into chaos and self-destruction (the awesome ‘Turn Left‘) and he was given the honour of the final scene of this years series as he took his grand-daughter back, at a terrible price, but did so with dignity. I will really miss him, because you get the feeling he will not be back. Martha Jones – even though she wasn’t given a great deal to do, when she was around she played her part well. They (the writers, especially Russell T Davies) are keen to show that she is progressing, from Torchwood 3 to UNIT, and at the end of series – who knows? Back to Torchwood? I loved her ‘breaking the fourth wall‘ look to camera when she was helping fly the Tardis back at the end of ‘Journeys End’. It was obvious she was having a lot of fun. That just made the episode even better. I hope she does get used on occasion, in much the same way they use Captain Jack. The return of Davros was pretty cool, though the Daleks petered out in the ‘Journeys End’ episode, when they looked so awesome in ‘The Stolen Earth’. I am sure they will be back. Nice to see the Ood back. I think it is obligatory to state that anything Stephen Moffat writes for Dr Who is fantastic – and so it was, with his two-parter ‘Silence in the Library / Forest of the Dead‘ being spooky and emotional and a bit mysterious (all that ‘River Song‘ business). It was good to see Mickey, but what was the point unless it was setting him up for Torchwood? Let us hope so, otherwise it was a waste. ‘Fires of Pompeii‘ was great (Donna really coming up with the acting goods), as was ‘Midnight’. David Tennant remains a brilliant actor and a great Doctor, and he is back for Christmas with the Cybermen, and beyond that for the specials next year. Captain Jack was as great as ever, and Sarah Jane Smith had a powerful scene with her son Luke when she realises the Daleks are back. K9 saved the world as well!! The regeneration cliffhanger at the end of ‘The Stolen Earth’ was EPIC. It beats the likes of ‘Primeval’ into a cocked hat. ‘Robin Hood’, while good, isn’t close – this is the epitome of Saturday night TV entertainment, and it should be cherished – let us hope that a years break makes it come back stronger when the regular series reappears in 2010. Rose – what was the point? The purpose of her return was, it appears to me, to seal her off for good with her very own Doctor to grow old with. Compared to Martha, who looked like she was having a jolly old time, Rose seemed to just mope around. A waste of time and it tarnished ‘Doomsday’ for me. Jackie Tyler – much like her daughter, except that this was a complete waste of time, apart from getting one joke out of it (the Doctor getting a bit nervous about her being at the controls of the Tardis). The Sontarans were wasted on an atypical ‘Invasion Earth’ storyline. ‘The Doctors Daughter‘ episode was rubbish, with a silly cloning story and no real buzz to the acting or action, and the ‘Partners In Crime‘ episode was plain boring and silly (and not silly in a good way). That did have an early glimpse of Rose though, which was a nice touch. Harriet Jones getting killed off (presumably). I’ll miss her waving her ID about. 3 so-so episodes, 5 good ones, 2 excellent and 3 classics – oh, and a brilliant Christmas episode (‘Voyage of the Damned’), and the 2008 Christmas special that is looking grrreat. The latest Doctor Who series is approaching its midway point on BBC1. So far it has been a mixed bag, though ‘The Fires of Pompeii’ episode was both involving and moving, and the Sontaran double header was entertaining enough. David Tennant shows no signs of boredom with the role, and he continues to excel as one of the great Doctors. The addition of Catherine Tate is a mixed bag, as she does bring more complexity to the assistants role than Freema Agyeman, but does employ a lot of her established facial tics and expressions that means you can never quite believe you are watching ‘Donna Noble’. You know you are watching Catherine Tate playing a role, one that isn’t that far removed from the characters in her sketch shows. However, she seems like an improvement on Martha Jones/Freema Agyeman, although she is back on board now for a few episodes with her rather flat acting. 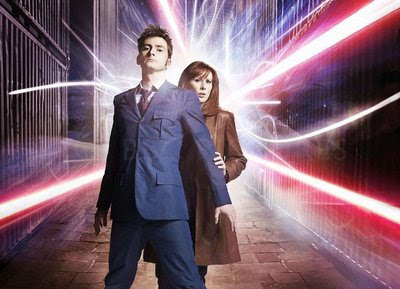 The remaining episodes hold much promise – especially the ‘Silence in the Library / Forest of the Dead’ story arc, which seems to be a return to the likes of ‘Blink’ (and if it comes anywhere near the brilliance of that episode, all the better). The series finale, with the anticipated return of Rose Tyler and the re-emergence of Davros, should be a classic. It is important to remember that even though Doctor Who can fall below the really high quality standards it sets itself (in episodes such as ‘Blink’ and ‘Doomsday’) even an average episode of Who beats the likes of ‘Primeval’ into a cocked hat. 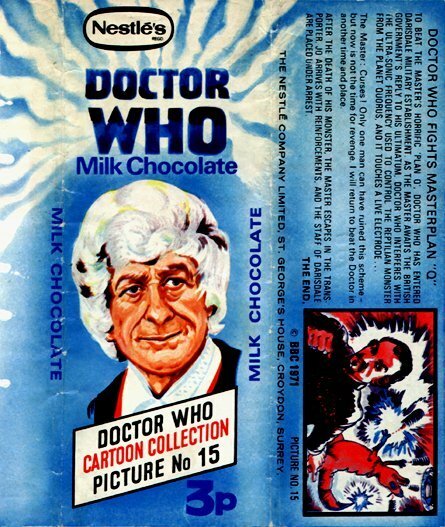 Going back 30 or so years now, to show that the good Doctor has always been unafraid of putting his name to goods, at the top of this post you will have seen a selection of Dr Who Chocolate bars from Nestles. 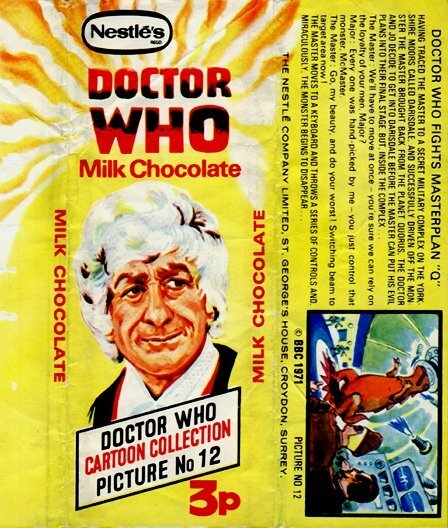 Aside from the image of the third Doctor (played by Jon Pertwee) on the front of the wrapper, it also told a story (with a picture!) 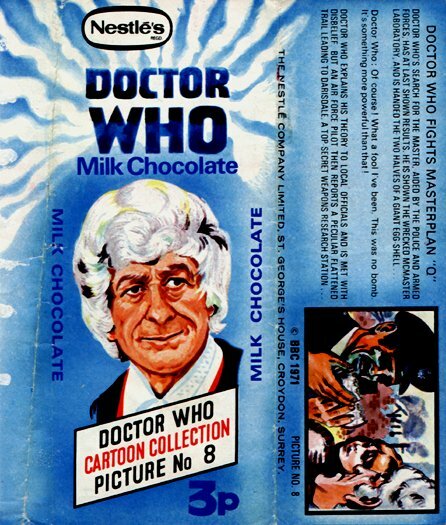 on the side – on the last wrapper, you get to see the (Roger Delgado) Master in all his glory! There were 15 to collect in all.